I workout regularly, or at least as regularly as my schedule permits. It's a habit I've tried to maintain my entire adult life. Besides the obvious health benefits, I find that regular exercise keeps me grounded, happy, and very often clears my head. 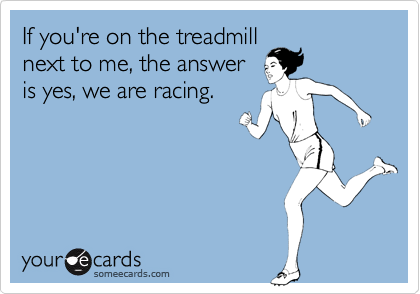 Lately, I've gotten real into playing a little game of who can I outrun on the treadmill. It first started when I noticed I was outlasting the people that were there when I started. But that wasn't really fair because who knows how long they had already been running. Then I started looking for people who seemed to me the serious "fitness types", the ones who looked like they were training for some major competition. Surely they'd be more of a challenge to beat. I found myself outrunning those people as well because again, who knows how long they'd been running by the time I got there. Next, I started "racing" against new comers, people who hopped on the treadmill after me. And guess what? I outran those people too, even the "fitness types". I found myself outlasting at least two if not 3 or 4 cycles of people. Success, or perhaps more succinctly, achievement is, as Denzel Washington was recently recorded saying, predicated on two things: discipline and consistency. Without these two things you can never create enough inertia in your life to move you towards whatever goal it is you want to achieve. Be it an acting career, a career in music, or especially a field like Network Marketing, your commitment level must have a long term mentality built into it, built into your work ethic if you’re to realize your dreams. In the treadmill game, I stay on until I win. Period. And I’m not just standing there either. That doesn’t count. That’s akin to calling yourself a network marketer when you haven’t hosted a party, attended an event, or even told anyone about your products or services for weeks or even months. No. On the treadmill as in my business, I am constantly moving, jogging, running towards my goal, UNTIL I WIN.